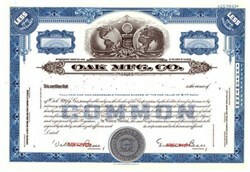 Beautifully engraved specimen certificate from the Oak MFG. Co. 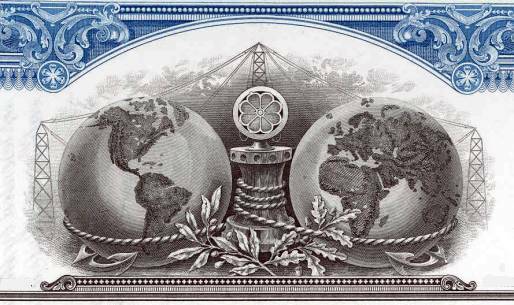 This historic document was printed by the Security Banknote Company and has an ornate border around it with a vignette of two globes on both sides of an early radio microphone with power lines in the background. This item has the printed signatures of the company's officers (Edward S. Bessey) and is over 50 years old. Historically, Aegis can trace its roots back to the Oak Manufacturing Company, which produced rotary switches and TV tuners in the Midwest and was founded in the 1930's. In the 1960's, the company was renamed Oak Communications and became a pioneer in scrambling and encryption technology. They also own On TV, a UHF subscription service in the Los Angeles Area. Oak Communications was the first company to mass produce a commercially successful addressable converter/decoder box. In 1993, the company was renamed TV/COM International, Inc. and became a subsidiary of Hyundai Electronics in 1995. In 1997, the management team for the analog product business, which had been operating as a standalone business unit within TV/COM, executed a management buyout to form Aegis Broadband, Inc.